The Code of Virginia allows school divisions to offer online instruction to students in multiple school divisions by entering into a contract with any private organization, educational institution, or nonprofit virtual school organization that has been approved by the superintendent of public instruction to operate as a Multidivision Online Provider. Edmentum is an “Approved Multidivision Online Provider”. Select Courseware courses have been approved by the University of California “a-g” program. All online courses approved by the University of California’s “a-g” program undergo a rigorous review process including an assessment of the curriculum against the iNACOL Standards for Quality Online Courses before the course is submitted to University of California for “a-g” review and approval. The Maine Online Learning Program was established to provide high-quality educational options for kindergarten to grade 12 students in this State using online learning programs and courses. The mission of the Nevada State Education Department is dedicated to ensuring opportunity, propelling learning, and promoting excellence. The Quality Matters Program is a leader in quality assurance for online education and has received many awards for its peer-based assessments and continuous improvement philosophy. Quality Matters’ Rubrics for online and blended course design have been adopted by more than 700 colleges and universities, K-12 schools and systems, and other academic institutions, and continue to influence many others. The GenNET Online Learning Portal provides K-12 students discounted curriculum with a wide variety of online courses. The GenNet approval process assures EdOptions Academy courses are aligned to Michigan standards, facilitated by state-certified teachers, and are vetted for quality and rigor. Edmentum is an Approved Multidistrict Online Provider in the state of Washington by the Digital Learning Department (DLD). Specific EdOptions Academy and Edmentum Courseware courses are now available to schools and students through the DLD Online Course Offerings. All online courses approved by DLD undergo a rigorous review process that includes providing supportive evidence of 54 required criteria. Edmentum’s fully accredited virtual school, EdOptions Academy, has been granted program approval by the NCAA Eligibility Center to offer nontraditional instruction for student-athletes. By partnering with Edmentum, school districts can use EdOptions Academy as a solution to offer nontraditional instruction to all students – including athletes pursuing a scholarship. Upon a 3rd party review conducted by Certica Solutions, 234 of Edmentum Courseware’s courses met the International Association for K-12 Online Learning (iNACOL) standards. Each course underwent rigorous review by Subject Matter Experts to determine if they met the 52 quality standards identified by iNACOL. All 234 courses reviewed scored 96 percent or higher on standards compliance. Edmentum’s EdOptions Academy is approved by the Louisiana Department of Education Supplemental Course Academy (SCA)/Course Choice program as a fully accredited, virtual online course provider. Select EdOptions Academy courses are approved and available to students under the SCA/Course Choice program. Edmentum’s EdOptions Academy has been awarded the ISTE Seal of Alignment for Readiness through the 2017-2019 school years. This approval recognizes EdOptions Academy as a highly effective resource for successfully acquiring knowledge and skills that are foundational to the globally recognized ISTE Standards. EdOptions Academy is a fully accredited, virtual school solution that allows schools and districts to enhance, expand, and extend their program offerings to meet the diverse needs of their students. Edmentum is one of the premier participants in the “WebbAlign Depth of Knowledge (DOK) Partner Program developed by Dr. Norman Webb, the creator of the DOK concept. 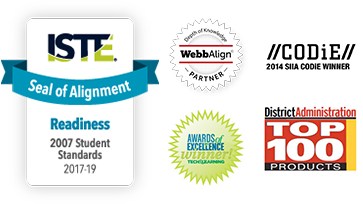 WebbAlign provides an innovative and highly respected approach to ensuring alignment of K–12 standards and assessments.The DOK Partner Program helps partners implement the DOK framework, which facilitates verifiable alignment between standards, curriculum, and assessments.